Also known as “free cooling,” water side economizing provides significant energy efficiencies because it doesn’t rely on traditional refrigeration. 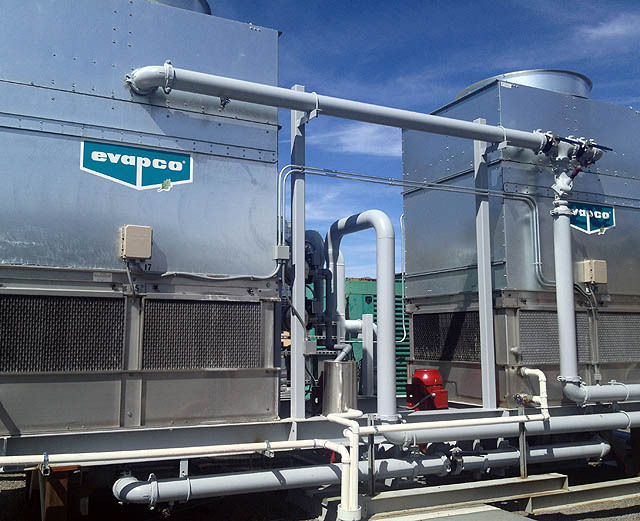 For this final post in my series about energy saving data center cooling strategies I’ll focus on the significant role water side economizing plays in modern data center HVAC (Heating Venting Air Conditioning). If you haven’t already, I recommend you read my overview of data center cooling and in depth article about aisle containment since I build upon information included in those posts. Why does water side economizing save so much energy? Traditional air conditioning requires a “chiller” to perform refrigeration, which uses compressors (a type of motor) to complete the state-changing processes necessary to remove heat. Motors not only consume vast energy while they’re running but their energy use dramatically spikes every time they turn on. In fact, the six-fold spikes are so dramatic that the power company charges businesses with large spikes from motors a special fee called a “demand charge.” The demand charge can account for nearly half of the total monthly cost for businesses which rely heavily on motors that often cycle on/off. Since the heat load in data centers is constant throughout the year, facilities that rely entirely on refrigeration incur enormous electrical bills. In fact, many traditionally cooled data centers can pay more money for power to cool than to power the actual computers. Since data centers in the US alone account for 2% of the country’s total electrical power consumption, we realize that we are talking about a considerable amount of energy. In contrast to traditional, refrigeration-based cooling, water side economizing ejects enough heat outside to reduce, if not entirely eliminate, the need for a chiller. Wet cooling towers, like those atop XMission’s data center, provide a much more effective and efficient means of heat exchange in Utah’s dry climate as they rely upon evaporation, somewhat like a swamp cooler. Traditional dry coolers, on the other hand, have metal fins wrapped around copper piping similar to your car’s radiator and function like the coils behind your refrigerator. While dry cooling towers require less maintenance, they can only facilitate free cooling during the coldest periods of the year (i.e., under about 40F/4C) due to the lower efficiencies of convective heat transfer. XMission’s new water side economizing plant utilizes redundant Evapco water cooling towers on our data center roof with pumps circulating cooled water down to the air handlers inside computer rooms and then returning warmer water from the air handlers back up to the towers. The air handlers are a combination of Liebert CRAC (Computer Room Air Conditioner) units and new CRAH (Computer Room Air Handler) units. The retrofitted CRAC units have fans on VFDs (Variable Frequency Drives) that move the air across a heat exchanging coil, and also include refrigeration chillers, if the water from the towers isn’t cool enough on hot days. The new CRAH units are optimized for water side economizing and have oversized heat exchanger coils inside, along with VFD-controlled fans, and don’t include chillers. Our aisle containment implementation effectively inhibits the mixing of hot and cool air. As I say in a previous article, reduced mixing means supplied server intake air doesn’t need to be as cold to still be cool enough when it reaches computer racks. This also enables us to run the water loop at higher temperatures, thereby reducing energy use and dehumidification problems. Lastly, the warm computer exhaust air from servers returns to the air handlers at higher temperatures, raising the temperature of the water loop as it returns to the roof. Less energy is needed to eject heat from warmer water, especially on hot days. Contrary to previously established cooling assumptions that computers need cold air to run reliably, since 2008 ASHRAE (American Society of Heating and Air-Conditioning Engineers) has determined that ideal intake temperatures can safely be as high as 80F/27C. Due to the heterogeneous composition of customer hardware in our facility, including networking gear with sub-optimal airflow configurations, XMission currently maintains computer intake air in the mid-70s. With greater control over airflow, we are more effectively removing heat from cabinets so in many cases servers are slightly cooler inside than before these upgrades. We are now also able to increase power usage limits in cabinets to facilitate greater density. Our humidification strategy has also changed dramatically. Previously, we ran redundant steam-based humidifiers to maintain 40% RH (Relative Humidity) which not only required 35 kiloWatts each but they ran nearly 50% of the time because the much colder coils in the air handlers were constantly dehumidifying the air. Our new adiabatic humidification system requires a fraction of the energy to maintain sufficient moisture to avoid static buildup in the facility. Decoupling ourselves from that hopelessly sisyphean cycle alone is saving us about 500 kWh (kiloWatt hours) each year. I’ve already mentioned how motors cause big spikes when they turn on but they’re also guilty of another energy inefficiency: they use significantly more power when running at 100% speed. In fact, the energy requirements start to skyrocket as fan and pump speeds increase past 50%. Since HVAC requires many fans and pumps, utilizing VFDs in all fans and most pumps and then optimizing the system to operate them within a range of 40-80% utilization as much as possible has yielded great savings for XMission. We’ve found that monitoring and graphing key components including temperatures (e.g., water loop supply and return, server air intake, return air to air handlers), power consumption (automated 15 minute samples at key points), and VFD fan and pump speeds helps us accurately gauge the potential energy savings from adjusting one variable at a time. For example, in the cooler months of the year we have determined that we can run the water loop at 60F/16C and save energy because the VFD fans in the air handlers can run slower while still producing cool supply air. In the hotter months, the water tower fans are unable to cool the water down that far efficiently, if at all, so we raise the loop up to 65F/18C even though it means the fans inside will need to work harder. Because we all rely on computers located in data centers as every day passes, it’s important to make these facilities as energy efficient as we can. While water side economizing has brought significant gains, mechanical engineers and data center managers continue to explore ever more efficient ways to manage energy usage in facilities. For example, air side economizing is among the cutting edge solutions gaining popularity. Building on many of the same principles as water side economizing, it ejects hot air from the hot aisles directly outside and cools with outside air whenever it is below temperatures as high as 90F/32C. The savings are dramatic but risk shorter computer lifespans due to outside dust contamination and potential heat related issues, although ASHRAE states allowed intake air temperature for computers can reach 90F/32C. Other strategies include using the earth or water sources to provide cooling. While we have yet to see how well XMission’s upgrades will help us weather Utah’s hot Summer months, we’re certain that the savings will be significant compared to previous years. In fact, we anticipate seeing a 35% total annual savings on power usage. Although XMission has long been a supporter of sustainable energy and has purchased RECs (Renewable Energy Credits), dramatically reducing power consumption is undoubtedly the best strategy for lowering our environmental impact.